The Thracian sanctuary near Tatul Village, Momchilgrad Municipality, is one of the most imposing megalithic monuments discovered on the territory of Bulgaria. It lies just 200 m away from the village and approximately 15 km away from Momchilgrad.The sanctuary is a massive rock structure and its top is a truncated pyramid. The complex comprises two sarcophagi, a rectangular bed for the main altar, and a three-metre-deep well. It dates back to the end of the 5th and the beginning of the 4th centuries BC. Evidence to that is provided by the clay vessels that were discovered in the region. The rock pyramid and the tombs surrounding it were built in the 13th – 11th centuries BC when the sanctuary reached its first zenith. The clay altars that were used for the sacrifices form a circle. Hundreds of religious artefacts were found there, including clay human idols and spindle elements, models of vessels, bronze items, figures of the God of the Sun, etc. During the excavations in 2004 – 2007 some unique clay items related to the sun deity were discovered: three model wheels of a Heavenly Chariot and a part of a gold mask. In the 13th – 12th centuries the sanctuary was damaged by earthquakes. According to historians the sarcophagus, the truncated pyramid and the side chamber illustrate the funerals of Orpheus and King Rhesus of Thrace, who according to myths reigned in the southern part of the Rhodopes and fought in the legendary Trojan War. A massive wall made of huge parallelepiped-shaped stone blocks was built during antiquity. Several buildings were discovered inside the sanctuary. One of them is a marvelous temple with 6 m-high walls that have survived to this day. An entire collection of bronze seal-rings dating back to the age of Antiquity was also found there. Construction and development activities was discovered in the area of the sanctuary in the first years of the 1st century AD. The renovated sanctuary existed until the 50s – 60s. The place was populated again in the second quarter of the 3rd century. Numerous Roman ceramic artefacts from this period were discovered. It is believed that the Hellenistic temple and the buildings surrounding it were transformed into a fortified Roman villa that became the residence of a wealthy local aristocrat. The estate was burnt down in 267 – 269 when the Goths invaded the Rhodopes. At the end of the 3rd century the villa was restored but with a much more primitive design.The new heyday of the region began in the 9th – 10th centuries. Another set of reconstructions took place during this period. 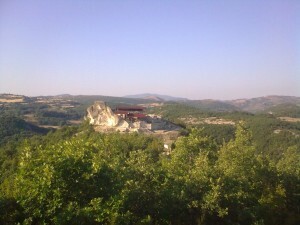 The final period during which the hill near Tatul Village was inhabited by people is marked by a medieval necropolis. Eight of its graves were studied. 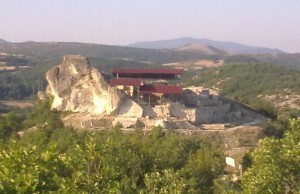 The necropolis was built no later than the mid-13th century and marked the end of centuries-long life on the hill near Tatul Village. The site is open for visitors. There is a security guard on the site and it is under constant video surveillance. The Wonders of Bulgaria Campaign took place in 2011 and after online voting the site was named one of the 10 wonders of Bulgaria.